A few years after moving to Scripps Ranch, Rick started reading articles in the community�s newsletter about the �illegal use� of open space. �Unlike where we had lived before, kids were actually out there running around in the trees, building forts, and playing with their imaginations,� he recalls. �They were putting up bike ramps to make jumps. They were damming up trickles of water to float boats�. They were creating for themselves all those memories that we cherish so fondly.� And now it had to stop. �Somehow,� says Rick, �that tree house was now a fire hazard. Or the �dam� might cause severe flooding.� Authoritative adults from the Scripps Ranch Community Association chased kids away from a little pond near the public library, where children had fished for bluegills since Scripps Ranch had been a working cattle spread many decades earlier. In response�. Young people moved their skateboard ramps to the foot of their driveways. But the community association reminded the residents that such activities violated the covenants they had signed when they bought their houses. I�m guilty. I would bet you are, too. Of assuming it�s just laziness that keeps today�s kids indoors, playing video games and watching TV. �Man, we used to go play in the woods,� I say, and you reply, �and ride our bikes miles away from home�� And off we go, talking about these kids today. Some of that is true, although I conveniently ignore the fact that I, too, spend far too much time in front of the computer. Time I could be out in the woods. Time that leaves me frustrated, rather than relaxed. But it wasn�t until I read the above words from Richard Louv that I began thinking about just how hard we make it for kids to do these things. I think I�d realized it, but never tied the loose ends together. This isn�t just about protectiveness. Certainly, there are dangers here in Metro Boston that weren�t present in 1975 in Western PA. But even taking that into account, there are things we/they won�t allow today that would be totally safe�if we let kids do them. If you can�t follow your outdoor muse in the open spaces, and you can�t do it in your neighborhood, and�like Louv describes�you can�t even do what you want in your own yard, what are you to do as a kid? Where I grew up, there was an unspoken understanding, that if land wasn�t clearly belonging to someone else, it was public land. We knew we couldn�t necessarily build tree houses there, or anything like that, but we were certainly made to feel that we could be there. That we could do whatever it is that kids do. And that is part of the point. Part of Louv�s and part of my own, and I don�t claim those are the same thing. 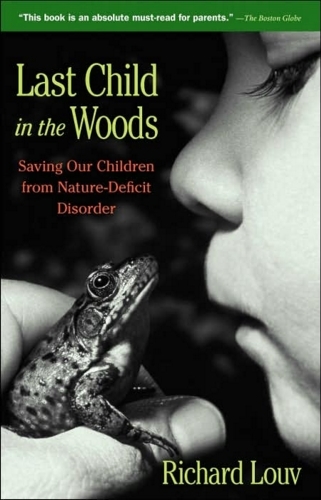 But kids shouldn�t need to have an exact reason to be in the outdoors. Organized sports have their place and teach good things, but they are not sufficient as a kid�s only time in the outdoors. Kids need time to follow their imaginations and play however it comes to them. At one point in the book, Louv describes a therapeutic garden, where kids can go and interpret things as they see them. Some see a hill there as a pregnant belly, some as a grave, some see it as something else. That is the beauty and power of nature�it never IS those things that we can imagine it to be. It just is what it is. But through being nothing that we make, it contains its own mysterious healing power. I wish I knew the answer to this problem. I really do. I try to supervise my daughter and allow her some of the same experiences I had. But certainly she isn�t as free as I was as a child. There�s nothing wrong with wanting kids to be safe, of course. But how can they be safe and yet allowed to experience that risk on their own that forms their character? And why can we no longer seem to provide that for them? Is there something wrong with us? Or, as I suspect sometimes, are there just too many of us? Too many individual needs that need to be met for any of us to be allowed to pursue them? Would we end up with public forests full of tree houses? I have no answers, but I sure can spot a problem when I see one. If you can�t play in the public park, and you can�t play in your own backyard, something needs to be done before our children are playing a video game called OUTDOORS, and paying to go to a theme park where they simply get to lay down in a field and play in a stream. Certainly awareness of a problem must be the first solution! You can purchase Louv’s book on Amazon.